^ a b Chass, Murray (December 16, 2002). "BASEBALL; With Sigh of Relief, Mets Trade Ordóñez". The New York Times. Retrieved 26 December 2017. ^ Rubin, Roger (December 16, 2002). "WITH TRADE, THEY CALL HIM DEVIL REY Ordonez out; Mets seek Neagle in 3-way". New York Daily News. Retrieved 26 December 2017. ^ a b Harper, John (December 31, 2002). "SANCHEZ GIVES METS 3RD THOUGHTS". New York Daily News. Retrieved 27 December 2017. ^ a b Habib, Daniel G. (March 3, 2003). "Jose Reyes: This teenage shortstop does it all--and he'll soon be doing it in New York". Sports Illustrated. Retrieved 26 December 2017. ^ a b Hermoso, Rafael (June 11, 2003). 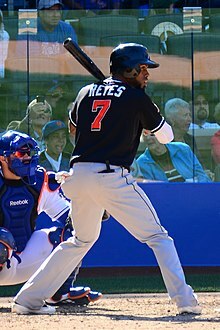 "BASEBALL; Reyes's Arrival Is Special Moment for the Mets". The New York Times. Retrieved 27 December 2017. ^ Rubin, Adam (February 16, 2003). "JOSE AIMS FOR SHEA REYES, 19, RARING TO GO". New York Daily News. Retrieved 27 December 2017. ^ "Jose Reyes injury: Mets 3B on DL, Justin Ruggiano signed". Sports Illustrated. July 30, 2016. Retrieved 30 July 2016. ^ Guardado, Maria (November 3, 2016). "Mets pick up Jay Bruce, Jose Reyes' 2017 options, decline Jon Niese's". NJ.com. Retrieved 17 November 2016. 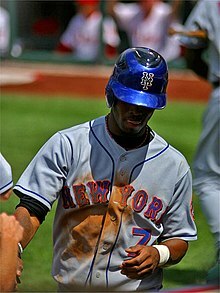 ^ "Jose Reyes' wife Katherine Ramirez". Player Wives. PlayerWives.com. Retrieved 18 February 2017. ^ Miller, Abigail (March 14, 2017). 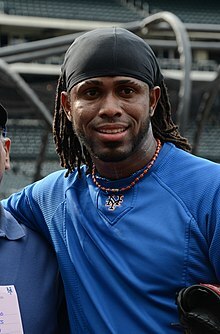 "New York Met's star Jose Reyes is sued by the mother of his love child". Daily Mail. Retrieved 21 March 2017. ^ Saunders, Patrick (November 9, 2015). 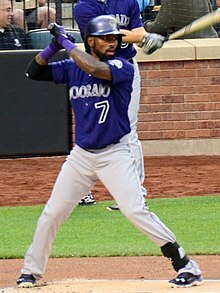 "Rockies shortstop Jose Reyes arrested in Hawaii for assault, according to report". Denver Post. Retrieved 20 November 2016. ^ Kernan, Kevin (April 4, 2018). "Jose Reyes and his wife thrilled to now be US citizens". New York Post. Retrieved 30 September 2018.